The Battle of the Marne was one of the most decisive battles in the First World War, as the Allies forced the German army to withdraw and stayed off imminent defeat. Having invaded Belgium and North Eastern France, the German army had advanced to within 30 miles of Paris. Their progress had been swift, having taken just over a month to advance deep into French territory. It seemed that Germany’s “Schlieffen Plan” was going to succeed in eliminating France from the war so they could focus their attack on Russia. On 3 September French General Joseph Joffre, ordered a halt to the French retreat and three days later began a major offensive. 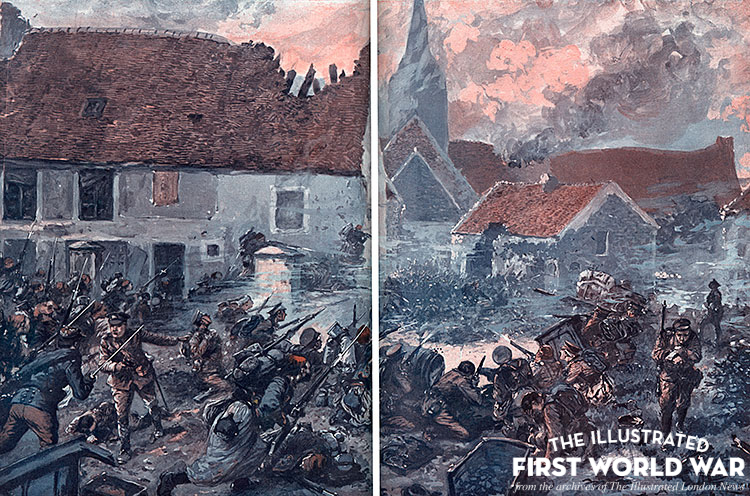 The Illustrated London News reported that the German army’s key mistake was believing that that the British troops on the left of the French main army had been “driven out of the fight”. The German right wing corps, therefore, attempted to cut the Allied armies in two between the British and nearest French corps. However, the Germans were checked by the French Fifth Army, while the Commander of the British Expeditionary Force, Sir John French, received reinforcements and vigorously took the offensive. By 11 September the German army, with their “venturesome move uncompleted”, were forced to retreat and fell back as far as the Aisne valley where they entrenched. “the price for the war lord’s [the Kaiser’s] ambition”. The battle had been a great victory for the Allies. The French capital had been saved and the Allies were given a fighting chance to push back the onslaught of the German forces. However, German press releases, between 6 and 16 September 1914, presented the retreat as tactical. Although Germany had lost a crucial battle she still had control of most of Belgium and occupied vast areas of north-eastern France. The war was far from over. to browse the archives for articles related to the Battle of the Marne.